A spacesuit is a pressurized garment worn by astronauts during space flights. It is designed to protect them from the potentially damaging conditions experienced in space. Spacesuits are also known as Extravehicular Mobility Units (EMUs) to reflect the fact that they are also used as mobility aides when an astronaut takes a space walk outside of an orbiting spacecraft. They are composed of numerous tailor-made components that are produced by a variety of manufacturers and assembled by the National Aeronautics Space Agency (NASA) at their headquarters in Houston. The first spacesuits were introduced during the 1950s when space exploration began. They have evolved overtime becoming more functional and complicated. Today, NASA has 17 completed EMUs, each of which cost over $10.4 million to make. On Earth, our atmosphere provides us with the environmental conditions we need to survive. We take for granted the things it provides such as air for breathing, protection from solar radiation, temperature regulation and consistent pressure. In space, none of these protective characteristics are present. For example, an environment without consistent pressure doesn't contain breathable oxygen. Also, the temperature in space is as cold as -459.4° F (-273° C). For humans to survive in space, these protective conditions had to be synthesized. A spacesuit is designed to re-create the environmental conditions of Earth's atmosphere. It provides the basic necessities for life support such as oxygen, temperature control, pressurized enclosure, carbon dioxide removal, and protection from sunlight, solar radiation and tiny micrometeoroids. It is a life-support system for astronauts working outside Earth's atmosphere. Spacesuits have been used for many important tasks in space. These include aiding in payload deployment, retrieval and servicing of orbiting equipment, external inspection and repair of the orbiter, and taking stunning photographs. Spacesuits have evolved naturally as technological improvements have been made in areas of materials, electronics and fibers. During the early years of the space program, spacesuits were tailor made for each astronaut. These were much less complex than today's suits. In fact, the suit worn by Alan Shepard on the first U.S. suborbital was little more than a pressure suit adapted from the U.S. Navy high-altitude jet aircraft pressure suit. This suit had only two layers and it was difficult for the pilot to move his arms or legs. The next generation spacesuit was designed to protect against depressurization while the astronauts were in an orbiting spacecraft. However, space walks in these suits were not possible because they did not protect against the harsh environment of space. These suits were made up of five layers. The layer closest to the body was a white cotton underwear that had attachments for biomedical devices. A blue nylon layer that provided comfort was next. On top of the blue nylon layer was a pressurized, black, neoprene-coated nylon layer. This provided oxygen in the event that cabin pressure failed. A Teflon layer was next to hold the suit's shape when pressurized, and the final layer was a white nylon material that reflected sunlight and guarded against accidental damage. For the first space walks that occurred during the Gemini missions in 1965, a seven layer suit was used for extra protection. The extra layers were composed of aluminized Mylar, which provided more thermal protection and protection from micrometeoroids. These suits had a total weight of 33 lb (15 kg). While they were adequate, there were certain problems associated with them. For example, the face mask on the helmet quickly fogged so vision was hampered. Also, the gas cooling system was not adequate because it could not remove excessive heat and moisture quickly enough. 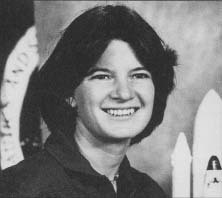 Sally Ride is best known as the first American woman sent into outer space. Both scientist and professor, she has served as a fellow at the Stanford University Center for International Security and Arms Control, a member of the board of directors at Apple Computer Inc., and a space institute director and physics professor at the University of California at San Diego. Ride has chosen to write primarily for children about space travel and exploration. Sally Kristen Ride is the older daughter of Dale Burdell and Carol Joyce (Anderson) Ride of Encino, California, and was born May 26, 1951. As author Karen O'Connor describes tomboy Ride in her young reader's book, Sally Ride and the New Astronauts, Sally would race her dad for the sports section of the newspaper when she was only five years old. An active, adventurous, yet also scholarly family, the Rides traveled throughout Europe for a year when Sally was nine and her sister Karen was seven. While Karen was inspired to become a minister, in the spirit of her parents, who were elders in their Presbyterian church, Ride's own developing taste for exploration would eventually lead her to apply to the space program almost on a whim. "I don't know why I wanted to do it," she confessed to Newsweek prior to embarking on her first spaceflight. The opportunity was serendipitous, since the year she began job-hunting marked the first time NASA had opened its space program to applicants since the late 1960s, and the very first time women would not be excluded from consideration. Ride became one of thirty-five chosen from an original field of applicants numbering eight thousand for the spaceflight training of 1978. "Why I was selected remains a complete mystery," she later admitted to John Grossmann in a 1985 interview in Health. "None of us has ever been told." Ride would subsequently become, at thirty-one, the youngest person sent into orbit as well as the first American woman in space, the first American woman to make two space-flights, and, coincidentally, the first astronaut to marry another astronaut in active duty. Ride left NASA in 1987 for Stanford's Center for International Security and Arms Control, and two years later she became director of the California Space Institute and physics professor at the University of California at San Diego. The Apollo missions utilized more complicated suits that solved some of these problems. 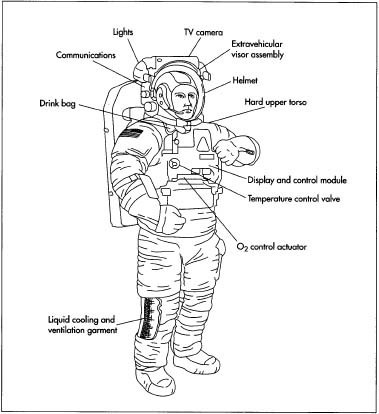 For moon walks, the astronauts wore a seven layer garment with a life-support backpack. The total weight was about 57 lb (26 kg). For the Space Shuttle missions, NASA introduced the Extravehicular Mobility Unit (EMU). This was a spacesuit designed for space walks that did not require a connection to the orbiter. One primary difference in these suits was that they were designed for multiple astronaut use instead of being custom made like the previous spacesuits. Over the last 20 years, the EMUs have undergone steady improvements however, they still look the same as they did when the shuttle program began in 1981. Currently, the EMU has 14 layers of protection and weighs over 275 lb (125 kg). Numerous raw materials are used for constructing a spacesuit. Fabric materials include a variety of different synthetic polymers. The innermost layer is made up of a Nylon tricot material. Another layer is composed of spandex, an elastic wearable polymer. There is also a layer of urethane-coated nylon, which is involved in pressurization. Dacron—a type of polyester—is used for a pressure-restraining layer. Other synthetic fabrics used include Neoprene that is a type of sponge rubber, aluminized Mylar, Gortex, Kevlar, and Nomex. Beyond synthetic fibers other raw materials have important roles. Fiberglass is the primary material for the hard upper torso segment. Lithium hydroxide is used in making the filter which removes carbon dioxide and water vapor during a space walk. A silver zinc blend comprises the battery that powers the suit. Plastic tubing is woven into the fabric to transport cooling water throughout the suit. A polycarbonate material is used for constructing the shell of the helmet. Various other components are used to make up the electronic circuitry and suit controls. A single EMU spacesuit is constructed from various tailor-made components produced by over 80 companies. The size of the parts vary ranging from one-eighth-inch washers to a 30 inch (76.2 cm) long water tank. The EMU consists of 18 separate items. Some of the major components are outlined below. The primary life support system is a self-contained backpack that is fitted with an oxygen supply, carbon-dioxide removal filters, electrical power, ventilating fan and communication equipment. It provides the astronaut with most of the things needed to survive such as oxygen, air purification, temperature control and communication. As much as seven hours worth of oxygen can be stored in the suit's tank. A secondary oxygen pack is also found on the suit. This provides an additional 30 minutes of emergency oxygen. The helmet is a large plastic, pressurized bubble that has a neck ring and a ventilation distribution pad. It also has a purge valve, which is used with a secondary oxygen pack. In the helmet, there is a straw to a drink bag in case the astronaut gets thirsty, a visor which shields rays from the bright sun, and a camera which records extra vehicular activities. Since space walks can last over seven hours at a time, the suit is fitted with a urine collection system to allow for bathroom breaks. The MSOR assembly attaches to the outside of the helmet. This device (also known as a "Snoopy Cap") snaps into place with a chin strap. It consists of headphones and a microphone for two way communication. It also has four small "head lamps" which shine extra light where needed. The visor is manually adjusted to shield the astronaut's eyes. To maintain temperature, a liquid cooling and ventilation garment is worn under the outer garment. It is composed of cooling tubes, which have fluid flowing through them. The undergarment is a mesh one-piece suit composed of spandex. It has a zipper to allow for front entry. It has over 300 ft of plastic tubing intertwined within which it circulates cool water. Normally, the circulating water is maintained from 40-50° F (4.4-9.9° C). The temperature is controlled by a valve on the display control panel. The lower garment weighs 8.4 lb (3.8 kg) when loaded with water. The lower torso assembly is made up of the pants, boots, "brief unit, knee and ankle joints and the waist connection. It is composed of a pressure bladder of urethane-coated nylon. A restraining layer of Dacron and an outer thermal garment composed of Neoprene-coated nylon. It also has five layers of aluminized Mylar and a fabric surface layer composed of Teflon, Kevlar, and Nomex. This part of the suit can be made shorter or longer by adjusting the sizing rings in the thigh and leg section. The boots have an insulated toe cap to improve heat retention. Thermal socks are also worn. The urine storage device is also located in this section of the suit. Old models could hold up to 950 milliliters of liquid. Currently, a disposable diaper type garment is used. An Extravehicular Mobility Unit (EMU). miniature battery-powered heaters in each finger. The rest of the unit is covered by padding and an additional protective outer layer. The hard upper torso is constructed with fiberglass and metal. It is where most of the suit pieces attach including the helmet, arms, life support system display, control module and lower torso. 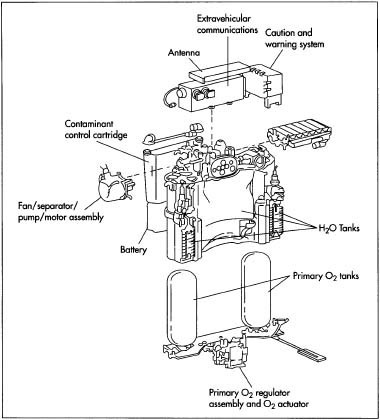 It includes oxygen bottles, water storage tanks, a sublimator, a contaminant control cartridge, regulators, sensors, valves, and a communications system. 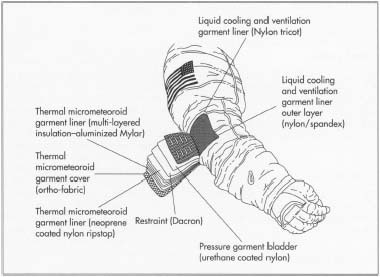 Oxygen, carbon dioxide and water vapor leave the suit through the ventilation garment near the astronaut's feet and elbows. A drinkbag in the upper torso can hold as much as 32 oz (907.2 g) of water. The astronaut can take a drink through the mouthpiece that extends into the helmet. Chest mounted control module lets the astronaut monitor the suit's status and connect to external sources of fluids and electricity. It contains all the mechanical and electrical operating controls and also a visual display panel. A silver zinc, rechargeable battery which operates at 17 volts is used to power the suit. This control module is integrated with the warning system found in the hard upper torso to ensure that the astronaut knows the status of the suit's environment. The suit connects to the orbiter through an umbilical line. It is disconnected prior to leaving the airlock. The primary life support system is a self-contained backpack that is fitted with an oxygen supply, carbon-dioxide removal filters, electrical power, ventilating fan, and communication equipment. spacesuits are modular so they can be shared by multiple astronauts. The four basic interchangeable sections include the helmet, the hard upper torso, the arms and the lower torso assembly. These parts are adjustable and can be resized to fit over 95% of all astronauts. Each set of arms and legs comes in different sizes which can be fine-tuned to fit the specific astronaut. The arms allow for as much as a one inch adjustment. The legs allow for up to a three inch adjustment. It takes about 15 minutes to put on the spacesuit. To put the spacesuit on the astronaut first puts on the lower garment that contains the liquid cooling and ventilation system. The lower torso assembly is put on next with the boots being attached. Next, the astronaut slides into the upper torso unit which is mounted with the life-support backpack on a special connector in the airlock chamber. The waste rings are connected and then the gloves and helmet are put on. The manufacture of a spacesuit is a complicated process. It can be broken down into two phases of production. First the individual components are constructed. Then the parts are brought together in a primary manufacture location, such as NASA headquarters in Houston, and assembled. The general process is outline as follows. 1 The helmet and visor may be constructed using traditional blow molding techniques. An EMU is made of 14 protective layers. Fabric materials include a variety of different synthetic polymers. The innermost layer is a Nylon tricot material. Another layer is composed of spandex, an elastic wearable polymer. There is also a layer of urethane-coated nylon, which is involved in pressurization. Dacron—a type of polyester—is used for a pressure-restraining layer. Other synthetic fabrics used include Neoprene that is a type of sponge rubber, aluminized Mylar, Gortex, Kevlar, and Nomex. Pellets of polycarbonate are loaded into a injection-molding machine. They are melted and forced into a cavity which as the approximate size and shape of the helmet. When the cavity is opened, the primary piece of the helmet is constructed. A connecting device is added at the open end so the helmet can be fastened to the hard upper torso. The ventilation distribution pad is added along with purge valves before the helmet is packaged and shipped. The visor assembly is similarly fitted with "head lamps" and communication equipment. 2 The life support systems are put together in a number of steps. All the pieces are fitted to the outer backpack housing. First, the pressurized oxygen tanks are filled, capped, and put into the housing. The carbon dioxide removal equipment is put together. This typically involves a filter canister that is filled with lithium hydroxide which gets attached to a hose. The backpack is then fitted with a ventilating fan system, electrical power, a radio, a warning system, and the water cooling equipment. When completely assembled, the life support system can attach directly to the hard upper torso. 3 The key components of the control module are built in separate units and then assembled. This modular approach allows key parts to be easily serviced if necessary. The chest mounted control module contains all of the electronic controls, a digital display and other electronic interfaces. The primary purge valve is also added to this part. 4 The cooling garment is worn inside the pressure layers. It is made out of a combination of nylon, spandex fibers and liquid cooling tubes. The nylon tricot is first cut into a long underwear-like shape. Meanwhile, the spandex fibers are woven into a sheet of fabric and cut into the same shape. The spandex is then fitted with a series of cooling tubes and then sewn together with the nylon layer. A front zipper is then attached as well as connectors for attachment to the life support system. 5 The lower torso, arm assembly, and gloves are made in a similar manner. The various layers of synthetic fibers are woven together and then cut into the appropriate shape. Connection rings are attached at the ends and the various segments are attached. The gloves are fitted with miniature heaters in every finger and covered with insulation padding. 6 The hard upper torso is forged using a combination of fiberglass and metal. It has four openings where the lower torso assembly, the two arms, and the helmet attach. Additionally, adapters are added where the life support pack and the control module can be attached. 7 All the parts are shipped to NASA to be assembled. This is done on the ground where the suit can be tested prior to use in space. The individual suppliers conduct quality control tests at each step of the production process. This ensures that every part is made to exacting standards and will function in the extreme environment of space. NASA also conducts extensive tests on the completely assembled suit. They check for things such as air leakage, depressurization, or nonfunctional life support systems. The quality control testing is crucial because a single malfunction could have dire consequences for an astronaut. The current EMU design is the result of many years of research and development. While they are a powerful tool for orbital operations, many improvements are possible. It has been suggested that the spacesuit of the future may look dramatically different than the current suit. One area that can be improved is the development of suits that can operate at higher pressures than the current EMU. This would have the advantage of reducing time currently required for prebreathing prior to a space walk. To make higher pressure suits improvements will have to be made in the connecting joints on each part of the suit. Another improvement can be in the resizing of the suit in orbit. Currently, it takes a significant amount of time to remove or add extending inserts in the leg and arm areas. One other possible improvement is in the electronic controls of the suit. What now requires complex command codes will be done with the push of a single button in the future. Suited for Spacewalking. NASA, 1998. I just heard that a new movie will be released in December, called Spacesuit. It chroniciles the design of the first spacesuits by Playtex in the 1960s. In the discussion about the movie, they mentioned that the zippers were made by YKK, a Japanese firm. I know that is incorrect. The Talon Zipper Company in Meadville, Pennsylvania made the zippers out of gold. Could you verify that for me? I grew up in Meadville, and my grandfather worked as a supervisor at Talon. One of his jobs every night, was to sweep the floor, and then weigh the gold dust to determine that none of the gold was walking out the door.